Initiative Measure 42 - don't be confused! We urge you to vote FOR Initiative Measure 42 (NOT THE ALTERNATIVE). In doing so, we're joining a multi-partisan team of Mississippi parents and education/business professionals - including leaders Jim Barksdale, John Grisham and Robert Khayat. As you can see from the sample ballot below, it isn't easy to vote for "the REAL" 42. Watch the short video below to make sure your vote counts! 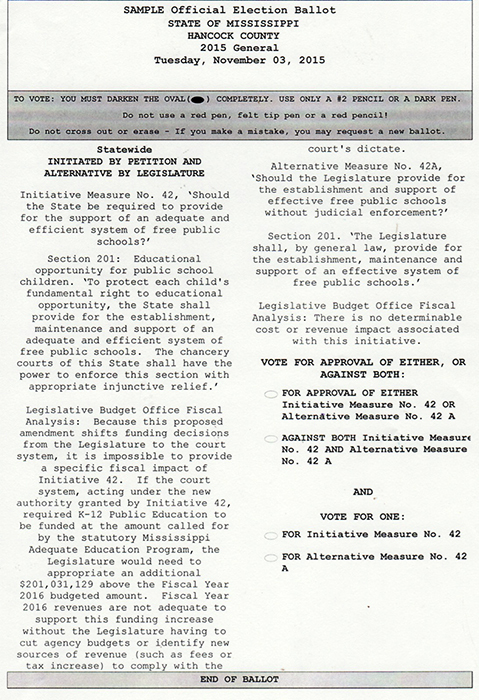 The sample ballot for Initiative 42 almost seems designed to confuse voters. Watch the video to find out how to vote if you're for it!